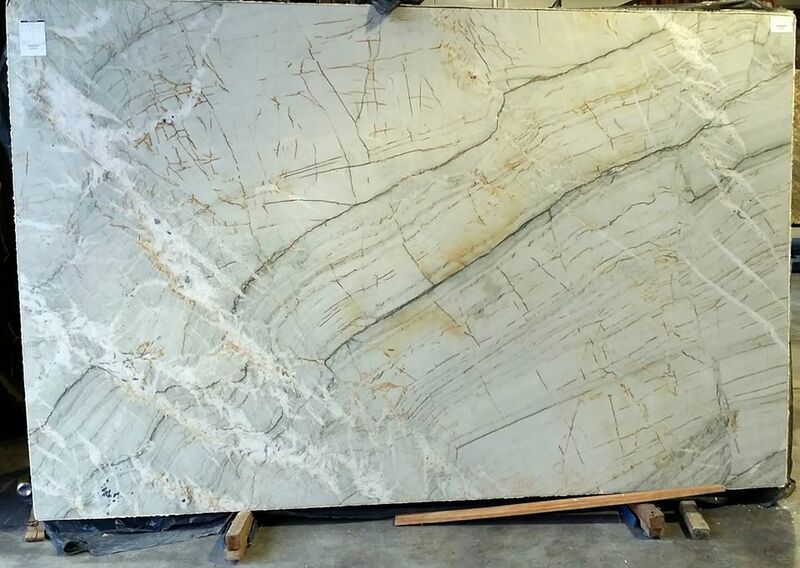 Nuage quartzite is quarried in Brazil. It is an overall grey stone that has subtle gold, with dark and light grey veining throughout the slab. It is an iridescent stone that has a high polished finish that seems to flow. Nuage will have a medium amount of variations, mostly from the veining. The veining in the stone varies from slab to slab, with no two slabs being exactly the same. Natural quartzite has the look of marble but acts like granite in durability. When Nuage quartzite countertops are paired with white cabinets, the white tones of the stone complement the cabinets, and the grey veining throughout the slab add a little depth to the area. The grey tones warm up the overall effect ensuring a clean, yet welcoming appearance. When combined with dark cabinets there is a contrast between the grey stone and the dark cabinets. The contrast allows for the darker veins in the slab to stand out and sparkle. Nuage quartzite countertops give any room a refined, simple, and elegant look while still remaining versatile. This light color will brighten up any kitchen, making it feel more spacious and luxurious. We have Nuage quartzite available at very affordable prices. Visit our showroom today or Reserve a Slab.